BURBANK, CA--(Marketwire - November 8, 2010) - Warner Bros. Records' 2009 digital holiday album Gift Wrapped: 20 Songs That Keep on Giving was such a smashing success that the label has created a new collection for this year's holiday season. 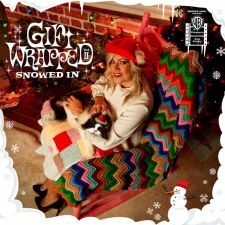 Gift Wrapped II: Snowed In, which features 11 brand-new recordings and five highly coveted and previously unavailable tracks, will be released digitally during Thanksgiving week. Extra-special bonus content will also be announced soon. Furthermore, a limited-edition two-LP vinyl pressing will be available as a gift only from surprise locations, and not available for sale. BRAND NEW ORIGINAL SONGS: Devo's quirky and warming "Merry Something To You," Cavo's stunning "Home For Christmas" (also with exclusive Song Mixer), Kara DioGuardi and Jason Reeves' original smash "New York in Wintertime," American Bang's heartfelt "Christmas Song," and Rachael Yamagata's melodic "Baby Come Find Me At Christmas," amongst others originals by The Goo Goo Dolls who deliver a trembling acoustic version of "Better Days," and Regina Spektor, who contributes a somber and eye-opening "December." COVERS: The holiday cover songs run the gamut in ambition and diversity. Foxy Shazam take on the risqué and controversial "Heaven on Their Minds" from Jesus Christ Superstar. The Ready Set bring a modern and anthemic sensibility to Paul McCartney's classic "Wonderful Christmastime," Oasis cover their fellow U.K. rocker's Slade's "Merry Christmas Everybody," The Dirt Drifters bring country to the U2 version smash "Christmas (Baby Please Come Home)," Everest dusts off the Marvin Gaye deep-cut "Christmas in the City," Stardeath and White Dwarfs shed a whole new light on Wham! 's "Last Christmas," and Tegan and Sara master a lovingly harmonious version of The Chipmunk Song (Christmas Don't Be Late), which features their mom on guest vocals. STANDARDS: Warner Bros. Records is honored to include the late Ben Keith's "Les Trois Cloches," featuring vocals by Neil Young and Pegi Young (Neil's only vocal holiday track), the Hitman David Foster also delivers a captivating arrangement of "Carol of the Bells," The Spill Canvas bring a true-to-form rendition of "It Came Upon a Midnight Clear," WMG newcomers House of Heroes capture an incredible "O Come, O Come Emmanuel," and The Flaming Lips contribute a live and crowd-involved version of "Little Drummer Boy." Ben Keith (Feat Neil Young and Pegi Young): "Les Trois Cloches"
Jason Reeves and Kara DioGuardi "New York in Wintertime"
Tegan and Sara "The Chipmunk Song (Christmas Don't Be Late)"
Devo "Merry Something To You"
The Ready Set "Wonderful Christmastime"
Foxy Shazam "Heaven On Their Minds"
Rachael Yamagata "Baby Come Find Me At Christmas"
Everest "Christmas in the City"
The Dirt Drifters "Christmas (Baby Please Come Home)"
The Spill Canvas "It Came Upon A Midnight Clear"
Stardeath and White Dwarfs "Last Christmas"
House of Heroes "O Come, O Come Emmanuel"
Also look out for exclusively sequenced Gift Wrapped CDs at Hot Topic (Gift Wrapped: Stocking Stuffer) and at independent music retailers (Gift Wrapped: A Change In Season) on November 22nd, 2010.